Morning Glory is found in three base sizes. The smallest, with six ribs, has a base size of 2 1/2 inches. 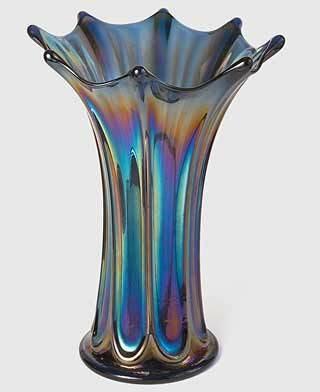 A similar Imperial vase named Thin Rib and Drape is sometimes mistaken for the miniature Morning Glory. The mid-size, with eight ribs, has a base size of about 4 inches. These are usually seen in the jack-in-the-pulpit shape (the photo shows both a straight shape and a JIP). 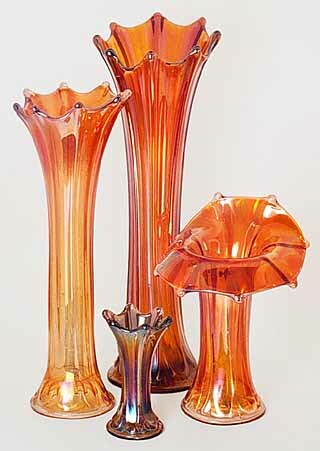 A similar Imperial vase pattern, Curled Rib, also is found in both jack-in-the-pulpit and straight, but the top appears to be swirled. The Morning Glory funeral size also has eight ribs, but a base size of 5 inches or a little under. Pictured on the right is a spectacular Morning Glory funeral vase blue.